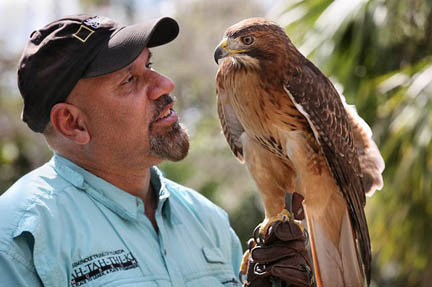 BIG CYPRESS — Reinaldo Becerra is a man of many hats but being a falconer puts another feather in his cap. The Air Force veteran, videographer, tour guide, environmentalist and animal advocate is also the only non-Tribal community outreach specialist at Ah-Tah-Thi-Ki Museum and the creator and presenter of the Museum’s increasingly popular bird of prey show. Staged at the Museum’s ceremonial grounds 2 p.m. every Tuesday, Wednesday and Thursday, the shows teach the special significance of the hook beaked and sharp-clawed birds also known as raptors. “Some people think they are bad animals because they are predators, but they are essential. They control species and are a vital part of the ecosystem. Once people get a chance to have a close encounter, they appreciate the birds’ importance,” Becerra said. Becerra, originally of Cuba, was introduced to falconry as a child. His mentor was a German refugee who escaped to the island nation during World War II. Becerra’s talent was eventually put to work by the Cuban military, which used falconry to control bird populations at airports. At age 22, Becerra defected to the United States, joined the Air Force and became a falconer at Naval Air Station Pensacola. “People don’t realize how much birds of prey are used to keep other birds and wildlife from causing accidents at air bases and airports. It’s unbelievable,” said Becerra, now age 50. According to a 2014 report by the Federal Aviation Administration, of 142,603 wildlife strikes against aircrafts from 1990 through 2013, birds accounted for 138,257 hits. In 2013 alone, a record number of 11,315 strikes were made – 97 percent by birds and 2.2 percent by land mammals. Anyone could read facts from a script but Becerra brings life to lectures. He was inspired by renowned master falconer Ray Pena, who performs at historic festivals and pow-wows nationwide. On a recent Tuesday, Becerra’s audience consisted of two women from San Francisco who marveled at the sight of Sabal, a 27-year-old red-tailed hawk, and Ellen, a juvenile red-shouldered hawk, responding to Becerra’s commands. Ellen, named for Museum security guard Ellen Batchelor, was born on the 60-acre property. During the show, her mother perched atop a towering cypress tree tweeting and squawking. The mother bird’s cries hindered her fledgling’s performance. “Sometimes that is why we call them bird of prey. Sometimes, if you let them loose, you have to pray they come back,” Becerra said. He peppers the show with historic facts about falconry and interesting details about Florida’s native predatory birds. And he tells spectators that the birds are not meant to be captured and owned; instead they are cooperative partners with humans for hunting and wildlife control. Becerra, who lives on a 7-acre ranch in Clewiston with horses, cows, parrots, dogs, cats and peacocks, was an animal trainer for movie production companies and at Parrot Jungle in Miami when he met Chairman James E. Billie in 1998. Chairman Billie hired Becerra to establish the bird of prey show at Billie Swamp Safari where Becerra then worked for 14 years. He was a videographer for Seminole Media Productions before transferring to the Museum last year. Like a bird, Becerra will not stand still on the ground. He is currently launching plans for a new venomous snake presentation and honing in on his next project – a critter show using indigenous Everglades animals. The far future includes hosting bird watching, hiking and wild orchid tours. Meanwhile, Becerra splits a non-typical 40-hour week between the Museum, festivals, schools and other educational opportunities throughout the region. Recently, he provided exhibits at the Battle of Okeechobee Reenactment. In May, he will perform at the Florida Folk Festival. “Outreach takes the culture out of the Museum and into the community at large. It builds stronger understanding,” he said.